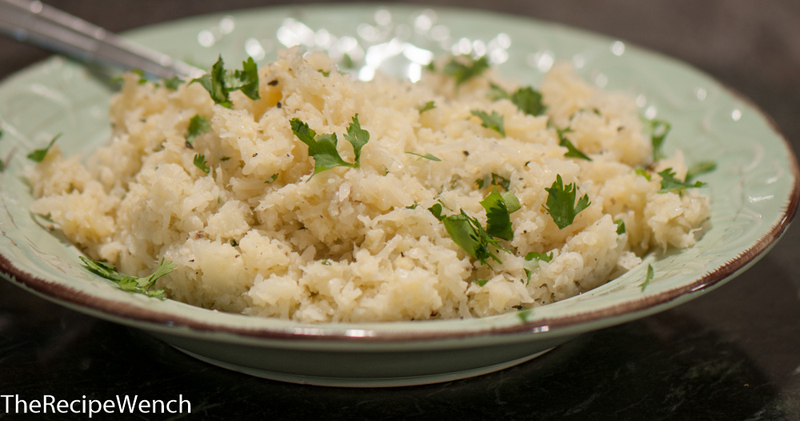 Recently, my cousin Sarah shared her favorite cauliflower “rice” recipe with me. Keep in mind rice is something we eat often at our house — both when I was growing up as well as current day. Just plain old white, medium grain, rice. I’m trying to convert to brown, but convincing everyone (Jeff!) is a slow process… It’s so simple to cook in a rice cooker, drizzle a little soy sauce on it and gobble it up. Personally, I like to add a bit of olive oil. Must be the Portuguese in me — olive oil makes everything better! So, being the rice lover that I am, I was quite skeptical of Sarah’s cauliflower “rice.” I am SO glad I went through and tried it. This stuff is awesome! In its December 29, 2014 article, the New York Daily News refers to cauliflower as the “new Kale” and predicts cauliflower will be the “2015 produce king.” I’m looking forward to discovering new cauliflower recipes and bringing them to you! If the new cauliflower recipes are as good as Sarah’s cauliflower “rice” recipe, then we are all in for quite a treat! So, about this cauliflower rice — this is a recipe I know I’ll be making often. I plan to double the recipe next time so I can save some for later. I even drizzled it with soy and loved it! I could easily substitute this cauliflower rice for white rice and not feel like I was missing out on a darn thing. That’s saying a lot from someone who grew up on rice as a side dish at nearly every dinner. Please give it a try and come on back and comment on how it worked for you, whether you’d do anything different, etc. I want to hear from you!